Family portraits at Golden Gardens! I have been photographing Erwin and Rebecca and their family for years since their wedding a decade ago. I love seeing them and their amazingly adorable son. This year, we have a new little one to add to the photographs. 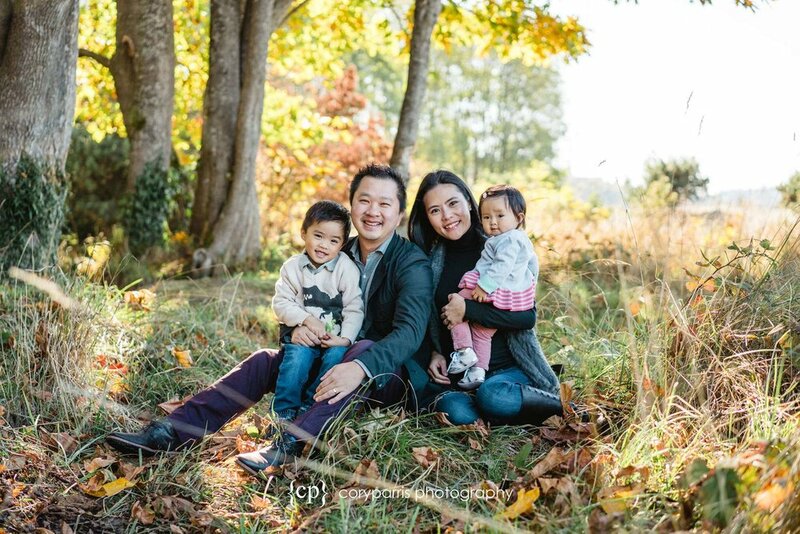 Check out their family portraits that we took at Golden Gardens Park in Ballard as well as the very cute kids photographs! My kids are fantastic! Here is are the three of them at the Oregon Coast this summer. I recently returned from a trip to Walt Disney World with my family. Below is a photograph of the castle during the fireworks show. With everything I know about photography, this image should be too blurry to use. However, that didn't stop me from trying to get it! First I'll tell you the reasons that this should not have turned out. It was taken with a cheap camera - Sony NEX C3 with a kit 18-55mm lens that sells used on eBay for about $250. Fireworks also require a tripod because you need a shutter speed of at least 1/2 second to get any trails on the fireworks. Together, those things should have made this image impossible to get with me standing in the crowd. One thing I did have going for me was the image stabilization built into the lens. Beyond that, I just took a ton of images totally expecting to only get a few keepers. Of the 75 images I shot, I would say there are about 7 keepers. Higher than I would have expected in trying this! There are some techniques that help in capturing images with slow shutter speeds without resorting to a tripod. If you are using an SLR or other camera with a viewfinder of some kind, press the camera to your face with your elbows tucked into the middle of your chest. If you are using a camera without a viewfinder, shorten the neck strap and press gently away from you at the limit of the strap, but not at the limit of your arms' reach. You can also put a shoulder on a stationary object like a light pole or wall, or rest your camera hand on a railing. I have found that, rather than holding my breath, I get the most sharp images by gently exhaling while pressing the button. Also, use the motor drive and take lots of photographs. If you can shoot several consecutive photographs, I have found that the second or third in the series is usually sharpest, but rarely the first or last. For the techinical details: Sony NEX c3 with 18-55mm lens set to 18mm (27mm equivalent) at f5, 8/10 of a second, ISO 400. This is not to brag about me, but rather encourage amateur photographers to try out stuff that isn't supposed to work. You never know, you might get something worth keeping! My Amazing Son and the Regional Spelling Bee! I am incredibly proud of my son, Kyler. After winning his school spelling bee, he went to the Regional Spelling Bee in Seattle. He made it to the fifth round and was one of 10 remaining contestants for a spot in the National Spelling Bee in Washington, D.C. His big goal going in was not to make a silly mistake in the first round, so he exceeded his goal. Here is one image of our trip to Disney World. This was taken with an Olympus Pen E-P1. My “new” toy for the trip. I will be writing a more detailed review of the “new” camera soon! My Daughter and her 16th Birthday Party! My daughter had her 16th birthday and her party last week. I thought it would be the perfect opportunity to try out my new “studio”. Alyssa shared her party with one her best friends, Emily. Here are some photos of them in their party dresses before the bash! The new “studio” is located just to right of my lawnmower…. My little girl just got her instruction permit from the Washington State Department of Licensing. Below is a recent photo of my little Alyssa. I swear I took it not very long ago! I think they let them drive when they are way too young! To be honest, Alyssa is a great kid. Very hard-working, intelligent, funny, responsible, etc. The photo below is a photo from our recent trip to Arizona. She almost looks old enough to drive in this one. She has assisted me very competently at weddings. It is a pleasure to see what a great person she is turning into! My Grandmother is a wonderful person. She has always been there for me. I lived with her for a couple of years while going to college, she loaned me money to buy camera gear (paid back at $100 per month for 30 months no interest), and has just been there for me. Here is a photo of her taken on her 90th birthday a couple weeks ago. Here are a few random images from a recent trip to Portland. Here is my beautiful present from my amazing wife. For those interested, it is a Breedlove Atlas Solo C35/SMe. Seattle wedding photographer & the Christmas Tree! We love Christmas. The lights, the fun family memories, the presents, the excited kids â€“ itâ€™s all great! We put up our tree the other day. Here are a few images I took. These were all taken with the combination of a Canon 5D and a 24 1.4L. Christmas tree out of focus. Just for fun, I spun the ring on the lens to make the tree be out of focus. I thought it looked pretty cool! I have a very good friend that is a manager at the Hard Rock Cafe Seattle. Mat (pictured below) is not only a restaurant manager, but also a very talented wildlife photographer. If you happen to visit his site, you will see wildlife of the animal kind just to be clear. He invited my family down for a friends and family preview of the cafe, which was very cool. We also got a guided tour and my daughter was thrilled to be able to pick a couple songs to be played. The location and view from the rooftop deck is fantastic. Oh, and the food was good. I recommend the granny smith apple & provolone burger! :) The official opening is on Wednesday, February 10th. Olivia & David - Wedding at the Antheia Ballroom in Snohomish! My "little" cousin David got married! I was lucky enough to be their photographer. It was great to see all of my family and seeing David and Olivia get married. They had the wedding at the Antheia Ballroom in Snohomish. You can find the slideshow here. Congrats David & Olivia! Last week, we took the Hunger Challenge as part of the United Way of King County's Hunger Week. For five days we gave ourselves the same budget as a family living on food stamps. That is $26 per day for five days, or a $130 for the five days for our family of five. When we were starting, we didn't think it would be incredibly difficult as we don't spend a lot on groceries anyway and none of us are big eaters (some people call us smaller than average, but we prefer fuel efficient). What we found out right away was that we had to do more planning what we would eat each day. There was no room in the budget for changing our minds about what we wanted on a given day. Also, we had to be careful about buying extra stuff. We normally have a fridge and freezer full of alternate meals and food just up for grabs for anyone that is hungry. The same goes for my mid-afternoon snack. I work from my home, so I can walk into our well-stocked pantry or over to the fridge and pick out a snack of either healthy or junk variety. These sorts of things would not be options for that kind of budget. It would also be hard to get better pricing by buying things in bulk. When you are using your entire food budget each week, buying large amounts of a food product would be extremely difficult even if it saved money in the long run. All of that said, we did not eat bad this week. We were able to prepare good, nutritious food that was very tasty and in budget. But we only had to do it a for a few days. To have to budget and eat that way for a lifetime, or any extended period of time would be extremely difficult. It would be much harder on a family that had very small children (buying formula), people with dietary restrictions, or just eat more than we do. It would be almost impossible to feed three teenage boys on that kind of budget. Finally, the hardest thing might be the inability to go out to dinner. We love eating good and interesting food at restaurants, and that is a big part of our weekend entertainment. With this sort of budget, the only eating out option would be to eat fast food. The day we were done with the hunger challenge, we went out for a frugal Thai meal (yum) that would have added up to a third of our budget for the five days of the challenge on a single meal and felt very fortunate to be able to do it! We are looking forward to doing more of this sort of thing. We are thinking that we may volunteer at a food bank next! Everyone love their children and think theirs are the best. I'm not different! Here are some photographs of my amazing children that we took in November for our holiday cards. Now that everyone has seen the cards, I can put out the images! All these are really just the tip of the iceberg. I could easily have put in another 20 images! I took a walk with my family at the Mill Creek Town Center. We each had a camera and took some images. Here are a couple I took and one by my nine year-old, Kyler. I will add some images from the rest of the family in the next couple of days. I'm helping each of the kids to process their images, so it is taking a little more time for them to get ready. Here it is. My mother will be happy to see a new photograph of me. Obligation fulfilled! Here is one of my favorites of my own kids from our holiday portrait session this year. I will making myself a large canvas from this image and a book of the images. How does one describe one's father. When you are little, he is your hero. When you grow older sometimes you are lucky enough to become friends. And they almost always pass away before you are ready. My dad died today. The whole world seems different knowing that he is gone. I remember being very little and his rough beard scratching my face as he tickled me. I remember him looking down his long nose with his piercing green eyes flashing as we argued when I was a teenager. I remember that he bought a new pair of black Levi's to go to my wedding. I remember the last time I talked to him that he told me how lucky I was to have such a great wife.